An ethical challenge for Greg Laden – put your money where your mouth is | Watts Up With That? We’ve had issues with Mr. Laden before, and being called on it hasn’t changed his bad behavior, hopefully he’ll learn something this time. This is a pretty simple black and white issue, so I’ll do it with bullet points. Yesterday, Mr. Laden claimed WUWT had sunk to a “new low” for daring to question the wind speeds of Typhoon Haiyan hyped in the media with ground measurements reported by the Philippine Meteorological Agency. Our position was the media poorly reported on the storm, made egregious errors that we documented, and that this led to inflated wind speed numbers given to the public, such as 235 kilometers per hour being reported as 235 miles per hour, to give an example. Let me ask you this but you better answer quick because the ground is sliding from underneath you as I type this. How important is 1,200 vs. tens of thousands? If it turns out to be tens of thousands instead of 1,200 will you STFU forever? Please? He then proceeded to write a long winded blog post at “ScienceBlogs”, and launch a Twitter tirade, from the position that he had some sort of moral high ground. As one WUWT commenter put it: The leftie pose of “We care more about real people than you do” is on full display. Yet, despite that angry posturing from that self-imagined moral high ground, Mr. Laden never once offered to help the people of the Philippines as WUWT has with the links to the Philippine Red Cross in the side bar graphic and in blog post links. Other bloggers such as Bob Tisdale have followed my lead with links in postings. Even 350.org’s Bill McKibben has thanked WUWT for providing him this info as he was pushing the “Save the Children Organization”, which isn’t disaster equipped. I waited over 24 hours to see if Mr. Laden had a conscience, and if he would offer his blog to help the people of Philippines or was simply interested in his holier than thou tirade against WUWT. So far, he has not. I made a donation to the Philippine Red Cross. I chose 5000 Philippine Pesos (PHP) from the menu, which works out to $118 USD as it allows Mr. Laden and others who may donate to easily match the contribution. The maximum value on the Red Cross donation page in the menu is 10,000 PHP, or about $230 USD. Between his donation (assuming he makes one), his readers donations (assuming he pitches it to them), and my donation along with WUWT reader donations, that should add up to a significant and useful sum, but any amount people may choose is useful and appreciated. Feel free to note your donation in comments if you choose. I challenge Mr. Laden to meet or exceed my donation, and to post a link and graphic on his blog to the donation page for the Philippine Red Cross, and encourage his readers to contribute. Be sure to select the campaign first in the menu pulldown to be Supertyphoon Yolanda (Haiyan), then select the monetary amount and the payment method. I also encourage WUWT readers to donate if they feel so inclined. It will be interesting to see if any other blogs who have been critical of WUWT pitch in to help. I’m betting few will as it isn’t in their nature but would be happy to be proven wrong. Full disclosure: My wife’s maternal side of family is from the Philippines, and we have learned that one of her relatives there has lost a home in the storm. We have no word on the others there at this time. But Watts and Homewood don’t want storms to be important for the simple reason that the best models strongly suggest that there will be more storms … especially in the Pacific, where Haiyan struck, over coming decades because of the changes to climate that humans are carrying out and that Anthony Watts and Paul Homewood deny to be real. Kubota, H. and Chan, J.C.L. 2009. Interdecadal variability of tropical cyclone landfall in the Philippines from 1902 to 2005. Geophysical Research Letters 36: 10.1029/2009GL038108. 1000 PhP is about 20 bucks (US bucks). REPLY: Yes I chose 5000, which works out to $118USD as it allowed Mr. Laden and others who may donate to easily match the contribution. the maximum value on the Red Cross donation page in the menu is 10,000 PHP. Between his readers and mine, that should add up to a significant and useful sum, but any amount people may choose is useful and appreciated. As always Anthony…you’re the best! Anthony, nice gesture! I matched your donation. The issue of wind speed is one of record keeping. The issue of storm damage is unrelated. The top wind speed of the storm could be 50mph or 350mph, but the damage exists regardless. In other words, asserting the wind speed was not reported accurately does not assert that there was less damage than there is. The same can be said of media coverage and reporting on the storm. If the actual speed turns out to be only 140mph it does not make wrecked homes pop back up, if it is 190mph more do not fall down. The equivalence between the discussion of the media reporting of facts about the storm and doubt of storm damage is a false one. REPLY: Sorry, you are off the mark. The word “damage” does not appear anywhere in that blog post, it was not raised as an issue of doubt by myself or Paul Homewood in that post. The issue was wind speed and sloppy reporting, making wind speeds seem higher than they actually were. I see you’d rather argue than help out, which is the point of this challenge, though I’m happy to be proven wrong on that point. If the actual speed turns out to be only 140mph it does not make wrecked homes pop back up. No it just means that the whole event is well within the realm of what anyone might expect without the CAGW alarmism. IT IS NOT EVIDENCE OF ANYTHING OTHER THAN OUR NEED TO CONTINUE TO CREATE WEALTH WITH ENERGY SO THAT WE CAN EFFICTIVELY DEAL WITH THESE INEVITABLE, NATURAL, SITUATIONS. Of course Laden et al are going to stamp their feet and feign bleeding heart syndrome if you dare question the horror stories they so love to paint. You’re shooing away at their stunning one-act offensive: blind emotion. Meanwhile, as Goofus is screaming at his spittle-flecked monitor, Gallant knows there is a place to act on emotion and a time to battle using reason. Case in point: call out factual inaccuracies while clicking the donate button to help those in need. I believe those in this camp are termed rational beings. Doubtless the ABC (the Australian one), the BBC, the Guardian and all the other left wing leaning media will continue with the much higher figure. After all, scary is good in their eyes. I have been trying to find the original source of the much quoted higher figure of wind speeds of “195mph and gusts up to 235mph”. It seems to be an offshore, not onshore, prediction by the USAF Joint Typhoon Warning Centre, based in Pear Harbour. In a real world, the reporting of an estimated prediction of offshore wind speed would be considered unreliable and actual observations would be used instead, but – big sigh – this is the world of ‘climate science’, where prediction is always so much more important than observation. Laden is not just vile, he’s incredibly immature. I mean, really: “If it turns out to be tens of thousands instead of 1,200 will you STFU forever?” How old is this guy? 12? UK Red Cross doesn’t seem to have the option to donate in PHP, but £80 seems like the corresponding amount, so I’ve gone for that one. Thanks to Anthony, as I’d probably not have thought about a donation had it not been on WUWT. As with Katrina (a Cat 3 at landfall, as I recall), most of the damage appears to have resulted from the storm surge, which some reports are putting at up to 5m. As with Katrina, and as Roger Pielke Jr has repeatedly shown, the main determinants of damage to assets (and loss of life) are features of topography, population, location of assets and human behaviour (successful evacuation, etc). All these factors convert hazards in to risks. Thanks for the prompt Anthony, donation made. I wasn’t suggesting anything about your donation. I went to the donation site and had no idea what I would be committing to since amounts are in PhP. I only posted that so others could estimate what a donation would cost in a familiar currency. This may be more applicable to the other blog, but I may as well post this here. I do not know whether you simply are mistaken, accidentally misinterpreted something, or are purposefully trying to mislead people here, but the assertion that Haiyan was at it’s height, simply a high end Catergory 4 equivalent cyclone, is false. In terms of the the PAGASA advisories listing Haiyan as a Catergory 4 equivalent cyclone, this is a understandable mistake. PAGASA uses a different measuring standard when reporting the windspeeds of tropical cyclones, compared to the NHC and the JTWC. Instead of using a 1-minute average that these two agencies use, PAGASA uses a 10-minute sustained average. Now the effect of this in terms of reporting is that their estimation of the strength of tropical cyclones is usually substantially less than that of what the aforementioned forecasting agencies would report. To give some recent examples, Typhoon Megi (deemed Juan by PAGASA) was reported by the weather agency to have winds on the ten-minute scale of 225 kph (140 mph) which in the one minute scale would be approximately 185 mph-190 mph, a windspeed which was confirmed by both satellite measures done by the JWTC and by aircraft recon inside the storm, making Megi officially a 185 mph Catergory 5 hurricane equivalent cyclone. Example #2, Typhoon Bopha (PAHASA designation Pablo), another Catergory 5 equivalent cyclone that impacted the Philippines in the past year. At the time of landfall, Bopha was reported by PAGASA to have winds at the ten minute windspeed at roughly 175-185 kph (110-115 mph) while in the one-minute scale maximum sustained winds were recorded to be 175 mph, per satellite estimates by the JWTC. Now, as far as I know, the record of these two storms holding Catergory 5 intensity is not in dispute, so based on this we can extrapolate that the 235 kph (147 mph) sustained wind estimate by PAGASA pretty much lines up with the 195 mph sustained wind estimate by the JTWC, and based on that number, the estimate of gusts up to 235 mph is not an unreasonable estimate either. I do not mean to seem nit-picky or in any way insulting towards your work, my point is simply that based upon the comparisons between PAGASA and the JWTC on the estimation of the top windspeeds of tropical cyclones, the assertion that the 195 mph sustained wind and 235 mph sustained gust reporting in news outlets is not any attempt to hype Typhoon Haiyan, but simply confusion between the 1-minute and 10-minute sustained wind measuring systems. Thanks Tony for your kind words and donation. Greg Laden is a fool. Still though, I believe the numbers of casualties will exceed the 10.000. My wife have a lot of relatives in the God forsaken town of Guiuan, that is STILL isolated 4 full days after the typhoon made landfall at exact Guiuan. It’s now 235 Km/s ? Why build something at al in typhoon or hurricane alley? What are they trying to prove? I bet Laden didn’t know this. Neither did I! Assumptions are the Mother of All FUps. My sister-in-law and a large portion of my extended family are from a fishing village on the north side of the island that was hit by the typhoon. She had built a concrete block one-room house there two years ago that provided shelter — and thankfully everyone in the village lived though the storm. We will be sending money directly to family there. I was disgusted that getting honest news about this extreme event was almost impossible because Western news media only wanted to make political hay off the pain and suffering of those in the Philippines. Karma should take care of those despicable cretins someday. Thanks for printing the truth about wind-speeds and magnitude — and thanks for being a site that I can trust to tell me the truth about damages and other things. Donation made via Oxfam (GB) – UK charity 202918 – whose priority at present seems to be getting clean water supplies to site, both for drinking and sanitation. Essential, I’d say. If I may add a note for any UK taxpayers here, Oxfam’s site seems to be the simplest to make any donations under the “gift aid” scheme (adding 25% to the gift value, as the UK gov allows the charity also to reclaim the donor’s basic rate income tax paid on the donation) – but you have to certify that you pay UK income or capital gains tax each (tax) year sufficient to cover the tax reclaimed on all charitable donations made in the year. And thanks for the prod Anthony; very timely. Thanks for the Red Cross link Antony. It always appreciate the chance to make donation directly rather than through third parties. Made my donation as suggested. Thanks for the Blog and sanity. 30% of my before-tax personal income from the sales of my ebooks (my profits from .pdf edition sales and my royalties from Amazon Kindle edition sales) from November 1, 2013 to December 31, 2013 will be donated to the Philippine Red Cross disaster relief for the victims of Typhoon Haiyan/Yolanda. Michael Larkin, both Faith and Hope weren’t quite so why should be Charity? Anthony, my reading of ckb’s comment appears to be the opposite of your interpretation. Just because there are knobs like Laden about, one shouldn’t assume everyone is like him. But, in this case there is little to be done other than for Anthony to reveal his generosity, otherwise how can the point be made? Donation made – thanks, Anthony. Because one shouldn’t take pride in being kind to fellow human beings. It diminishes the giver and the receiver alike. I’ve been wondering how I could contribute and can’t thank you enough for your side-bar link to the Philippine Red Cross. Have matched your donation Anthony. While I don’t want to detract from this tragedy, what concerns me the most is where the most damage happened. For those that don’t know the locations that suffered the greatest damage and loss of life, they were located in the poorer area’s where shanty towns and poor quality slum like dwellings are the norm. This is in stark contrast to those locations that are located in similar geographical area’s, but are made of modern and more sturdy materials, such as brick and concrete. The storm surge, while making a mess in the more affluent area’s, as well as causing some concern as to the clean up and the related logistics, suffered much less, including a far lower loss of life. By way of example, the Yasi Cyclone that hit Queensland was far more powerful, yet only one person died. Arguably, through his own stupidity, quite accidentally. This is the difference between an affluent nation and a poor one. Between good buildings and bad ones. Also, between a well educated and self dependant population and one reliant on government direction. The damage caused by Yasi affected a wider area and caused far more devastation. Wind speed is relative, hiding behind loosely assembled salvaged junk, facing a category three or four storm, is not. Expecting it to stop a huge storm driven tidal surge is fanciful at best. While building a township in a known, low lying, flood prone, tidal surge affected, seasonal storm alley is never a wise idea, some people have no choice, as it’s their only option. Furthermore, it is clear that modern technology and it’s related wealth is able to assist in not only reducing casualty’s, but also reducing the time taken to repair the damage. In addition, wealth, more technology advanced nations can return the local population fairly quickly to some normalcy and thence to greater potential for local wealth creation, once more. While there are many lessons to learn here, Man Made Global Warming and it’s related vile peddlers of indulgences are not one of them. As for Mr. Laden, if he has something he wants to flog to death, might I suggest he joins Opus Dei. This tends to cut out the middle man and teaches one humility. As opposed to his being cheerily flogged by all and sundry, without the humility. Mr. Laden, the Philippines needs to be able to build up it’s technology, infrastructure, tidal and storm defences. This solution won’t stop storms, but it will certainly save lives. Michael L, in one way you are right (as in the Pharisee and the publican, which actually illustrates a wholly different issue); and yet, we are not to hide our light under a bushel, and a good example can accomplish much. Anthony and other donors were not bragging; rather, they were exhorting others to follow their lead and provide actual help to those less fortunate, as Christian charity dictates. Sorry Anthony, I am happy to be proven wrong but I must record my honest opinion. Introductions like “Super Typhoon Haiyan/Yolanda – another overhyped storm that didn’t match early reports” before all the facts are uncovered beyond dispute, in my opinion do not enhance the excellent time honoured reputation of WUWT. Yes, alarmism has been rampant for decades and in the past global warming has been blamed by the more extremist alarmists for just about every natural event under the sun. But does that mean every natural disaster that occurs is exaggerated as a matter of course without professional journalists checking their facts? 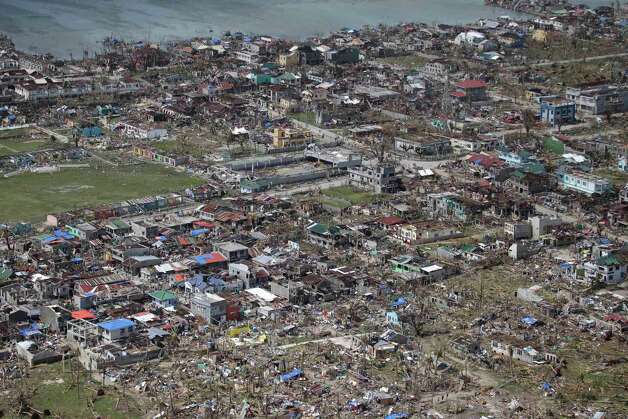 “ Nevertheless the BBC are still reporting today Typhoon Haiyan – one of the most powerful storms on record to make landfall…The storm made landfall shortly before dawn on Friday, bringing gusts that reached 379km/h (235 mph). Unfortunately we cannot always trust the BBC to give the facts these days.”. “Around 1200 UTC on November 7, Haiyan attained its peak intensity with ten-minute sustained winds of 235 km/h (145 mph) and a barometric pressure of 895 mbar (hPa; 26.43 in Hg). This made it the second-most intense tropical cyclone in the Northwest Pacific Ocean on record, based on wind speeds alone, along with Bess in 1982 and Megi in 2010, only after Tip in 1979. Six hours later, the JTWC estimated Haiyan to have attained one-minute sustained winds of 315 km/h (195 mph) ….unofficially making Haiyan the fourth most intense tropical cyclone ever observed. Several hours later, the eye of the cyclone made its first landfall in the Philippines at Guiuan, Eastern Samar, without any change in intensity; if verified, this would make Haiyan the strongest tropical cyclone to make a landfall on record, surpassing the old record of 305 km/h (190 mph) set by Hurricane Camille in 1969.usts up to 378 km/h (235 mph). These speeds are incidentally what the BBC reported. If they are officially accepted as fact will Paul Homewood be making an apology to the BBC as well as a donation to the Typhoon Relief Fund? I do not know how typhoon world records are made official, whether it is the lowest pressure, the highest recorded wind speed, the highest estimated wind speed, speed before landfall, speed after landfall, the highest number of deaths, damage or what. And I believe the Civil Aviation official who inspected the whole area by air when he said that he had seen the aftermath of typhoons in the Philippines for 30-40 years but he had seen nothing like this. Was Paul Homewood in this case premature assuming that alarmists as usual were hyping this disaster up and perhaps pre-empting what the alarmists were going to say? 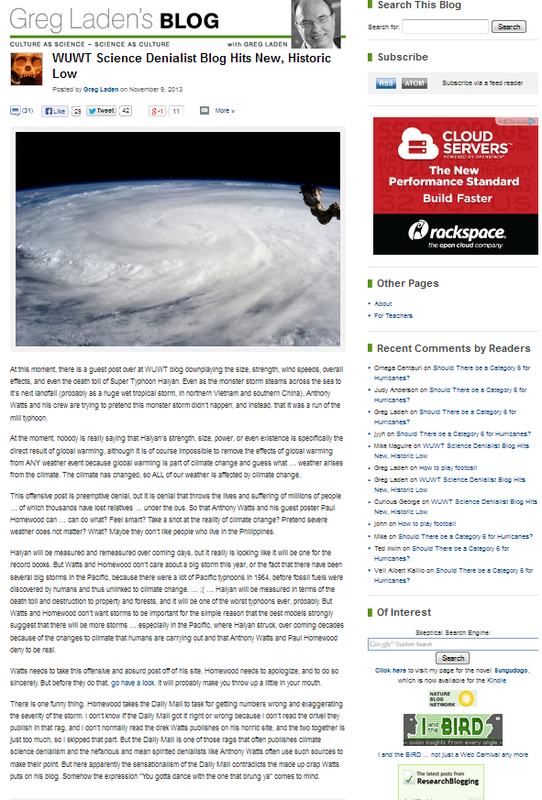 So far I have not seen one article or comment from alarmists blaming global warming for the typhoon – not to say it will stay that way. Maybe this was not Paul’s motive but that is the impression I gained. It is pretty obvious from the TV coverage of the aftermath that preparedness, poverty and communication played a big part in the devastation and there is a big case for better adaption and especially support to poorer nations to counter extreme weather events rather than supplementing the UN’s demonization of CO2. I will therefore be happy to join your call for a donation hopeful that this will occur in the future. It’s typical behaviour of a lot “lefties” I personally know. They holler “higher taxes (on the so-called rich)” and when their taxes go up (because they are in the “rich” category) they begin hollering again. My lefty friends are the ones crying for all sorts of gov’t handout programs and yet they don’t give a dime to charity. In fact, they are the ones most likely to split the dinner bill down to the penny where the rest of us split and round up to the easy bills . They want the credit for being concerned of others but I don’t see a lot of evidence that they are truly concerned. Maybe that’s the way they shed their guilt; by publicly announcing their support of any program that helps the needy. Just don’t expect a donation. @Michael: I don’t feel particularly proud or superior for stating that I donated a few bucks (around $23) to an urgent cause (just like I’m sure you don’t feel proud or superior when you lecture others on the proper way to do kind things); I kind of thought it might help encourage others to do the same…that OK with you? Oxfam is a UN agency, and thus they are completely opaque. The UN adamantly refuses to permit any independent audit of its spending, and we do not know how much goes for administration. I prefer making a donation via the Phillipine Red Cross, on the sidebar link. Donation of $230 USD made. Thanks, Anthony, for making this easy. Laden is out to cash on this. It’s not a “lefty” issue. It’s a character issue. dbstealey says… nope. Oxfam is not a UN agency. It is a NGO, a charity, that was originally founded to campaign for the easing of the blockade on continental Europe during WW2. The founders thought that famine was not an acceptable weapon of war. They are a good way to give. On the subject of which I do not undersatand how anyone could have missed the need to give from our relative riches to those suffering in this horrendous circumstance. It isn’t a left wing/right wing issue. It is a humane issue. Thanks for the Red Cross link. Congratulations! This is to confirm that your payment has been completed. Some excellent strategic judo there. Laden pushed too hard and ended up flat on his back. Anthony: I tried to match your donation but got into some kind of Pay Pal loop: it told me I had one active card but insisted I had to enter a new credit/debit card. Even entering my already on-file card info didn’t get past that. I’ll try again later. You paint with too wide a brush POME.. This storm will be hyped up as “unprecedented” despite the fact \hat it was weaker than typhoon Tip in Oct 1979 reported as “Earth’s Strongest, Most Massive Storm Ever” and which still holds the record for the lowest surface atmospheric pressure at 870mb and was probably larger than Haiyan but fortunately was far less damaging. None of this is important compared to the loss of life and destroyed livelihoods in an area that was only starting to recover from earthquake. But politicians put furthering their power above all else. Matched your 5000, Anthony. Is there a way to establish how much WUWT readers donate in total? Anyone remember the “10,000” dead in the WTC collapse? I guess they are still trying to find the other 7,000, right Laden? Seems that’s happened before. I’m sure he’s comically infuriated right about now, filled to bursting with Mannian style rage. The gracious, smart, likeable thing to do would be to swallow his pride and jump on board. Which of course likely means he’ll do exactly the opposite. I appreciate WUWT exposing this too. Worlds maximum wind speed measurement was on Mt Washington observatory, NH in 1934 at 231 mph and hasn’t been exceeded since. Years ago I knew that. This reads less like a challenge and more like an admission that you were wrong, wrong, wrong about the severity of the storm. Anthony, I hope your relatives are OK. Thanks, Anthony, for the donation prompt, without which I might have never have gotten round to doing anything. What sort of person brags about their charitable donations? @louise – what sort of person criticizes charitable donations while making none themselves? No Oxfam is not a good way to give. Oxfam is a leftist ONG political institution which mission is to indoctrinate trough giving. Which is btw what most “giving” organisations do. bks – I disagree. “The storm was catastrophic and Filipinos desperately need our help.” “Maximum wind speeds were overstated by certain individuals in the MSM.” Both statements are correct. I think Anthony is trying to move past what has become a trivial discussion about the initial reporting, and try to perform some genuine good for the people who’ve been affected. I’ve donated C$50 Anthony (I didn’t see a way to convert it to PHP on the Canadian site). My thoughts and prayers are with your wife’s extended family. BTW I still don’t see any mention about the relief effort on Laden’s site. Ah, my post on their forum is still there, http://www.mountwashington.org/forums/showthread.php?5789-WMO-lists-new-wind-gust-record-113-2-m-s-(253-mph-220-kt) . 2010 Jan 24. Hmm, those parens may not get handled by WP, this link. The leftie pose of “We care more about real people than you do” is on full display. The truth is, the lefties do not care more about real people, they only care about how bossy and how idealistic they can be, they do not give a tinkers cuss about real people! dbstealey said (November 11, 2013 at 3:17): “Oxfam is a UN agency, and thus they are completely opaque”. Worlds maximum wind speed measurement was on Mt Washington observatory, NH in 1934 at 231 mph and hasn’t been exceeded since. Oh rats. A new record was recognized in 2010, my reply with details and a link is stuck in moderation. It’ll show up sooner or later. My concern is that those who consider AGW to be true seem to be willing to do lots about an uncertain future whilst doing nothing to help real people now. This type of cant was on full display over the NSW bush fires. The watermelons were deriding Tony Abbott and trying to make out that it was all his fault for wanting to wind back the Carbon tax, whilst sitting on their backsides drinking their soy macchiatos. Meanwhile Tony who is a volunteer fiery was in the field supporting the heroic fire fighters. I don’t think that anybody could fail to be moved by the scenes from the Phillipines, but the suggestion that this problem could be solved simply by introducing emissions control is pure rubbish and utterly wicked. The whole situation is getting worse with people like this. The May 31 F5 Tornado, later downgraded to an F3 is classic. Grab the headline, and then assume the debunking will not be heard. This was a strong cat 4 at landfall according to the people observing it. But which is more extreme as far as making statements about where nature is going and why: This storm, sticking out like a soar thumb in a global season well below normal, or 3 Cat 4s in 4 years hitting the relatively tiny island of Hispaniola ( Flora 1963,Cleo 1964, Inez 1966) 8 Major hurricanes up the east coast in 7 years, 1954-1960? Which is the more extreme, unusual event, 8 years without a major saffir simpson hit on the US, or a super typhoon hitting the Philippines. Since the former has never occurred before, the latter quite a few times, how is a sane mans thinking become an example of AGW driven catastrophe’s. Save the Children has a long history of helping people affected by disasters. I was working with them (as an advisor) when they responded to a large cyclone in Bangladesh in the 90s, for example. Disclosure: I do not work for Save the Children but have worked alongside them for over 20 years. At the end of the day, the absolute quantum of the storm size is irrelevant. Any cyclone that crosses into the cat 3 SS equivalent in size is going to cause serious damage. Wind speed measurements, like temperatures, are local and focal, and may or may not represent the overall broader geographic impact. Sandy being the most recent case in point. As has been mentioned, there are many more important determiners of impact. From a disaster response perspective, we already have more than enough experiential data to understand what is needed to mitigate and respond to such a tragedy. Rather, we obfusticate over where the actuarial break line of risk acceptance is. First responders, be it the Red Cross, or a multitude of agencies, must be pragmatic and triage the event. The capacity to do so, along with local preparedness, is what determines the impact. This is the roll of the dice of life. Begrudgingly, because both people and governments have very short attention spans to preparedness, we know (I am a trained and experienced Red Cross first-in disaster responder), that there will be horrific casualties in such events. We also know that arguing the point saves no lives. That happens by people who do rather than talk, and do quickly, sometimes dispassionately but with great angst, to be dealt with when the initial event is contained. While I very much appreciate Anthony’s somewhat emotional challenge to the sociopaths of this planet, the essential thing now is to go, do. Money, physical ability, support for those who can go, do. Go. Do. Discussions of the storm itself will yield little resolution to the present impact, Without the will to mitigate the outcome of the next and the next, it’s just idle chatter. I think one part of this overlooked by the media in their effort to grab headlines is the historical results of strong storms hitting the Philippines. They do take them seriously yet every major storm kills between 300-800 people. The farther back in time you go the higher the death toll, which is worse yet similar situation for other countries affected by Tropical Cyclones. Money spent on carbon crap schemes would be better spent on shelter design and construction, because that is what is needed. You took my advice (to put his money where his mouth is)! That makes me so happy. One really vile thing I saw on his blog was the encouragement to come here and post nutty anti-science rants to try to discredit Anthony. I can’t imagine anyone, ANYONE on this blog tolerating a suggestion to do that on his blog. The left always likes to claim the moral high ground, I guess they are so accustomed to such nasty under-handed behavior that they don’t even think about it anymore. Thank you, Anthony. My Dad served in the Philippines in ’46. He loved the country. A general word of caution about charities, particularly those that “pop up” in the wake of a disaster. Check them out to be sure that their business is the cause they espouse and that they are not primarily in the business of being a “charity”. Where did Mr Laden go, anyhow? I arrived on Guam shortly after Super Typhoon Paka hit the place. One of the things we had to do during the recovery was replace all the anemometers on all the weather stations on the island. The maximum wind speeds weren’t actually recorded during that storm as the instruments were blown off their mountings before reaching the peak. The engineers gave some estimates of the wind speeds, but no one could say what the actual speed was. These typhoons in the tropical Pacific are nothing to sneeze at. They have a lot of heat to work with and long straight lines with no mountains to slow them down. We had a lot of damage to clean up even though most of Guam’s buildings are made of concrete. I can’t imagine what a storm like that would do to a thrown together, plywood and sheet metal structure like the poorest areas of the PI have. I hope most of the people evacuated to higher ground and firmer structures, because the walls and roofs of those shanties would serve as lethal projectiles, turning their homes into hellish, murdering blenders. I’ll do Mr. Laden one better. I’ll propose an entirely new scale with much finer resolution: The Desert-Ark Scale of severe storms. There are, naturally, 40 units to the scale, allowing splitters all kinds of room for meaningless number f*rting. So, Mr. Laden, in the DA scale, where would this storm fall between desert level impact and Ark level impact? PS I am not implying that the Philippine Red Cross falls under the “business of being a ‘charity’” category. I just donated 2500 PHP to Philipino Red Cross for Relief from Yolanda (Haiyan). Glad it’s possible to donate directly to the Philippine Red Cross, hopefully the aid will get to where it’s needed quickly. Thanks for posting the link Anthony. If the purpose of announcing your gift is pride (to show off or brag), or if there is a chance of embarrassing the person receiving the gift, then yes, it should be done in private and maybe even anonymously. If however, by announcing the gift, there is a chance that you will (without pride or risk to the receiver) inspire, encourage, or otherwise make it easier for others to give, then your gift can (and perhaps should) be made publicly without reservation. That giving publicly may cause unintentional discomfort for someone who chooses not to give is not a relevant concern. Louise, nobody is bragging about their donations. Communication does not equal bragging. Fact: the more people who COMMUNICATE their donations, the higher the likelihood that others WILL DONATE. Issuing challenge grants is a tried and true fund raising method and wholly in keeping with true Christian principles. It requires guts and certitude because the nay-sayers always attack one for doing it — the more successful it is, the more they attack. I would respectfully suggest there can be a difference between setting a good example, and being boastful. ”the JTWC estimated Haiyan to have attained one-minute sustained winds of 315 km/h (195 mph) and gusts up to 378 km/h (235 mph). This unofficially ranks Haiyan as the fourth-strongest tropical cyclone on record in terms of wind speed, only exceeded by Typhoon Ida (325 km/h) in 1958, Typhoon Violet (335 km/h) in 1961, and Typhoon Nancy (345 km/h) in 1961. How exactly is 378 exceeded by 325, 335, and 345? I’m not saying it’s wrong, I’m just saying it’s highly likely there’s a miscommunication/typo/error somewhere. Those who are sniffing at stating donations obviously have never watched a Jerry Lewis or public broadcasting fund raiser. Challenge donations are announced all the time, though under friendlier banter. In this case, shaming into donating was the game available to our blog host, compliments of the idiot. Ant***y volleyed back. Game set and match to Ant***y. Well done. Thank you for that link. I was wondering if the Philippines had a Red Cross to contribute to. Now I know. Whatever the motivation of Anthony to publish the Philippine Red Cross link at the top of his blog yesterday, and his post today, it sure has motivated a lot of WUWT posters to donate. I didn’t know what PhPs were until a couple clicks for the exchange rate. Thanks for the motivation encouragement Anthony, good job. I agree with Bastardi,,,,,,, how can they live with themselves. They know they are not telling the truth. Then again, the highest ranking official in the US does exactly the same thing. That does not make it right. It only makes it more wrong. John, your article lists sustained winds and wind gusts. It correctly lists the other three in terms of sustained winds compared to Haiyan’s 315 km/h sustained wind. The wording is a bit confusing when they use the term “wind speed” as an equivalent term with “sustained wind”. Owen in GA says “The maximum wind speeds weren’t actually recorded during that storm as the instruments were blown off their mountings before reaching the peak.” … exactly … so who knows what the wind speed was in this case? 5000 from me too. Nice action, Anthony ! I was fortunate to go there 12 years ago: Philippines is a very nice country full of very nice people! King of Cool exactly expresses my opinion, it was the headline “overhyped etc” that triggered my response. I felt that the terrible situation by Haiyan was misused for another attack on the AGW church over the back of the victims (dead or alive) in the PI. That some of the sceptics felt our piety was nauseating well that says more about them then us who are sceptics as well. My wife has a lot of relatives in the area (Iloilo) with many of them we have not been able to even get in touch, even we are in Manila. Some of us with fly to the place as soon the flights will resume to find out what happen to them. Sometimes it’s better to leave the battle with the alarmistas for what it is. This is called political correctness, the first and last refuge of a scoundrel. It is designed to shut us up. Violating it in other societies might lead to a late-night visit after a phone call tips off the powers-that-be. Here mostly it results in a chorus of demented comments from crazy people which is still enough to cower the weak and timid into shutting up. It has been used effectively in our own District of Criminals to steamroll over timid opposition to every Socialist idea that comes along, until we have now reached the incredible position of having the politically correct point of view being to NOT speak up about debt, and the politically correct point of view is to fall in line and approve everything. Guess where this all ends up. Exactly. Two things happened. One was a monstrous storm. The other was that people in the Philippines were in its direct path. The storm, though not as monstrous in intensity as originally claimed, was devastating to the people in its path. The alarmists need the pain and suffering to accomplish their objective, which is to convince the general public that the storm was the “worst ever” and (of course) was due to the progression of global warming/climate change. Had the storm never approached land and never harmed a soul, the reporting on its peak strength likely would have been accurate, or at least more easily corrected. But now, with the “worst ever” meme established, the reporting naturally turns to the human devastation and any corrections are buried in the damage coverage. Thus do the alarmists utilize human carnage to accomplish their objectives. Then, as with Mr. Laden, they accuse anyone shining a light on their subterfuges of being uncaring cretins. Yet they are the ones using human suffering to advance their goals, and probably their own fortunes as well. Incidentally, the sort of mind that seeks advantage in such an “opportunity” is unlikely to be particularly charitable. Michael Larkin says “Charity should be anonymous.” It all depends on motivation and only each of us can judge that for ourselves. Some might think it wrong that Anthony is calling out Laden for the gold digging, attention seeking D – Bag that he is, but, what the heck it gets the ball rolling. Anthony gave a donation and others think, “Yes, I would like to help too! Thanks, Anthony” It’s not like he sold his house and took a vow of poverty, he’s just reminding us that there is something we can do here in front of our computers. I think Laden should do the proper thing and stop using fossil fuels. First thing to do would be to STFCD .. Last two words … ‘Computer Down’ then he will help save the planet. If a meteorologist can’t ask for accurate wind speed data, who can? 1) The official death toll is 1,200 people. 2) Up to 10,000 people are estimated to have dead. The 1,200 figure is certain to rise, as it rises you stick to that otherwise you end up with words like “revised down”. Do we estimate global warming? No, everyone is very ‘precise’ indeed. Laden is enjoying the Streisand effect – he is less unknown thanks to this kerfuffle and his distortions. I liked it better when he was an unknown idiot but maybe it’s a good thing that more people know he’s an idiot. About a dozen photos from accessible areas. I have made a $100 contribution. Your employer might have a policy of matching your contribution. Doesn’t hurt to ask. I happen to believe that accuracy based on observations is the best thing we can do in memory of disaster victims. We should hold media, politicians, and scientists accountable for pushing agendas and MAKE them toe the line defined by calm, clear thinking and unimpeachable accuracy. Else we muddy the waters of restorative response to devastation and sorrow, even making it worse. Clear thinking is our best course of action in the face of disaster. Best course. So for those who chastise this blog post, would you herald the opposite as a better response? Shall we be silent? I pray not. We should wade into the fray with full intent and resolve to restore order and bring panic to its knees. … also depends on the type of anemometer(s) deployed; standard ‘cup’ anemometer or ‘sonic’ anemometers installed (or deployed) in the path of the hurri -er- cyclone. My mother told me to “never argue with an idiot because nobody will know the difference” however Mr. Laden is not an idiot…he is evil, he knows exactly what he is doing, so I think what Anthony is doing is absolutely necessary. Even though it gets old, lies must be confronted every time, or the liars will cause even more suffering and destruction. We all know that those who lust for power, control and destruction are using “climate change” formerly known as “global warming” to satiate their unholy lusts. Those scheming snake-oil-salesmen have to lie about the disease of “climate change” in order to scare people to buy their cure-all-snake-oil which is ultimately the destruction of affordable energy. Why would people want expensive energy? After pondering this question for years and reading everything I could find pertaining to this question I have come to the irrefutable conclusion that the alarmists actually lust for power and control so much that they are willing to destroy everything that cannot be controlled, including people. Some of these eco-terrorists even want to reduce the world population to 500 million, which would mean that 11 of every 13 people in the world would have to die. All this destruction and death is necessary in order to satiate their addiction to power because if it can’t be controlled it must be destroyed. Think Pol-Pot and the Khmer Rouge disguised as scientists and politicians. I donated through the Canadian Red Cross. The Canadian Government will match my donation. Payment sent. Proud to be a “DENIER”!! Add my 5000 php, and ask Mr. Laden and his ilk to match. Greg — Maybe have an adult help? Charity should be anonymous? Since when? The beauty of charity is that, when people see someone giving, many are moved to do likewise. It’s not like Anthony (and others) gave a million billion dollars and crowed it from the rooftops. He gave a decent donation, told us about it, then encouraged us to do likewise. Looks like it’s working just like a charity drive should (as Anthony plainly stated). I vowed many years ago to never give to huge charities with massive overhead, so I chose to donate via a very good friend. His wife is from the Philippines and her family was affected. Any time I can give directly, directly to people who actually have skin in the game, that is the route I choose. My buddy and his wife have their own personal drive going with monies going directly to a specific village. This is the way charity works. If done in secret – few will ever give even a mite. I find the discussion of anonymous versus non-anonymous donations to be extremely condescending toward the typhoon victims. It smells like righteous quibbling. How likely is it that data from the (or from ‘them’, the) Meteorological Buoy(s) survived or was recorded/captured by a land station? Over the weekend as news of the severe damage and casualties in Tacloban City came in, reviewed older images of the area on Google. The number of flimsy exposed houseboats on the bay was sobering. Even sturdy houseboats on Lake Union, north of downtown Seattle, would be in a pile on the shore after Cat 4 winds.The location of Tacloban’s airport (DZR) on an exposed low lying peninsula (elev. 10 feet) would have been underneath a tremendous storm surge. The area, better described as a barrier island, probably assisted greatly in allowing it to be cleared and reopened for flights by Philippine Airlines on Monday, 11/11/13. Yet, The Seattle Times today uses The New York Times piece reporting, “By some accounts, the winds raged ashore at 190 mph.” How about reporting PAGASA’s account? And, “…it was unclear if the power of the storm was tied to climate change,…” Unclear to who? The reporter? I soured on emergency relief after waste and misdirection of donations after the Haitian earthquake. Perhaps this will be different. Thanks Anthony for the donation link. My thoughts, prayers (and now dollars) out to the people affected in the Philippines. Also glad to see my tax dollars used via the US military to aid the area–by far the most effective logistics operators in the world–but they are very energy intensive! Thanks for the correction. I thought Oxfam was UN. Happy to be corrected. It would appear to me, though I’m no math major, that 255 is a lot closer to 1, 200 than 10, 000. If that low of a number holds, will Mr. Laden follow his own advice and STFU? Well done Anthony for mobilizing the folks here. We have personal friends in the Rotary Club of Loyola near Manila. They have a large water tanker that is now on its way to the devastated area along with emergency supplies and money. Local shipping and transportation companies are suspending charges for relief efforts. We are raising funds from local Rotary Clubs in New England to support the efforts of those on the ground in the Philippines. Greg Laden is one disturbed individual and should be given as little attention as possible. Being as I am a poet I will not follow Anthony’s futile example and send real money to help relieve the real suffering of real people. Instead I will follow the example of Greg Laden. I am currently contemplating writing a poem about this issue. It may take several years to complete. During that time period i will, of course, hold the moral high ground. PS — The joke has already been made (several months ago discussing another big storm and not by me) but is worth repeating — The demand that a category 6 be created on the storm scale begs — begs! — that it be called CATEGORY GORE. Is there a bigger windbag on the planet? The US is the outlier in using sustained winds based on one minute readings. Most of the rest of the world uses ten minute readings. One minute readings are roughly 12% higher than ten minute readings. I just donated 5,000 PHP to the Philippine Red Cross. In your face Greg [snip] Laden. Is there a way of tracking how much your readers have donated? I have donated as well. Perhaps Laden should redirect his anger at Al Gore whose Climate Reality Facebook page tried to capitalize on the human misery with this picture posted to their blog. Excellent point. The SA did amazing work in New Orleans and were there long after the headline seekers had gone. Everyone should use their judgment on which fund is most likely to do the most good with the funds donated. I too have donated 5000 PHP thanks for making it easy. I donated through the US Red Cross Typhoon Appeal (see their website). In December 1980 I spent a week in Cebu on a business trip – my company had a plant there on Mactan Island – which is right in the middle of the worst-hit area of the Philippines. It’s heart-rending to see the damage and the evidences of suffering, and I’m wondering if the people I met while I was there came through OK – I sure hope they did. Wonderful people there – you can’t help but fall in love with them all. A pox upon Greg Bin Laden, and especially upon Bloody Mess, trying to make money off people’s suffering. How low can you go? People ()if that is the correct word for these reptiles) like them have to look up to look down. Because I’ve had acquaintance with people in the stricken area, I take their insults and lies personally. The following post on Laden’s blog will give you some idea of the type of moronic plot to expect here. It is to be expected of AGW to resort to tactics where they THINK that they will be able to argue based on conspiracy theories. It is the warmists that are clearly educationally challenged. Does ‘G’ not realise that the people that believe in conspiracies came from pro AGW sites by people PRETENDING to be skeptics. As for the original post screw it up and put it in the bin, Laden. Greg, re #3, you’re not obligated to “respect” his decision to censor you for criticizing him. You’d be well within your rights to call him a censorious arse-haul right here, and dare him to let you post at length lest his refusal to do so expose him for what he is. Get on his site under a pseudo, and post comments that appear to agree with him, but take it to the logical conclusion and bring in other issues that will make the postings seem absurd or paranoid or otherwise objectionable. For example make reference to “the truth about 9/11″, and “the New World Order,” and refer to the President by a derogatory name with vague racist overtones, and so on. This needs to be done subtly in order to work, and it’s best done by a group of people working together. The net impact is to associate the objectionable blog article with a range of other content that average readers will find objectionable, so their emotional reaction against the postings carries over to the blog article itself. Also useful, if he comes over here and sees this post, it will leave him wondering how many posts on his blog are of this type. That will in turn alter his censorship behavior, either to make him more paranoid and censorious (and alienate a portion of his audience), or to make him more likely to let other stuff stay up (in which case take advantage by shooting down his denialism and sounding far more reasonable than the crazy-posts). This sort of tactic is a no-no in polite debate, but IMHO it’s justified when dealing with extremist content that poses a clearly foreseeable threat of harm to others. Climate denialism, anti-vaccination conspiracy theory, and overt hate speech fall into that category, along with the more obvious cases such as support for terrorism. sadly I have nothing to give. I will however put a link on my site ( http://www.theconservativevoices.com/index ) to donations in a few moments. for those that were able to donate, thank you. If someone makes a factual error because they misunderstood or were sloppy, it can be corrected. If someone takes a position because of “tribal identity,” all you can do is point out the flaw and let the “tribal warfare” continue. Unfortunately, it seems most people still operate on that basis. 1,000 PhP on the way now from me and my wife. Great work, Anthony. Thanks for mentioning Greg Laden and his desire to install a catergory 6 for cyclones in the age AGW. I am reminded of the movie “Spinal Tap” where one dude purported that his amp was more powerful than the other guys because it went up to 11 on the volume knob. The WSJ has a good and frightening overview of things on the ground. At the airport, flanked by fellow officers, U.S. Marine Lt. Col. Mike O’Neil said some 200 marines were preparing to help provide humanitarian aid, including assisting in flying some 90,000 tons of relief supplies waiting in Manila. Other planes laden with aid were likewise landing throughout the day. That’s 180 million pounds. By plane. FedEx reports that their average daily volume in more than 3.9 million packages and 11 million pounds of freight. And they have 634 aircraft. ok got links up in multiple spots on my end, hope it helps somewhat. There’s no harm in being a little proud of a good deed, Michael. Judgmentalism, on the other hand, has no good side to it at all, and yet you seem proud of your finger-pointing. Proud enough to repeat it. Despite The Philippines kicking us out of Subic Bay Navy & Clark Air Force bases in 1991, there are quite a few US assets still in the islands, supporting the federal government’s poorly publicized war against militant Muslim separatists in the south, descendants of the Moros whose amok attacks inspired the Colt Browning .45 cal semi-auto pistol. “The best models”? How good are they? Name them. Most here are not indifferent to the personal loss a weather event may cause to real people. We are also not indifferent to the “hype” and PR that is driving a political agenda that would keep nations impoverished and/or make the citizens of nations in a position to help impoverished for “The Cause”. Laden, be honest. What have you done to help anyone now or in the future? Set them up to be ruled by the “benevolent elite”? I may just be beating a dead horse here, and I really hope that I do not come off as some troll, but there really needs to be a correction to the assertions made in both these blogs. PAGASA uses a 10-minute sustained wind standard to measure winds in a tropical cyclone. This is different than the 1-minute sustained wind standard used by the National Hurricane Center, the Joint Typhoon Warning Center, and for the scale commonly used in the citation of past windspeeds of tropical cyclones in the meteorological record. This difference in standard means that PAGASA frequently measures the windspeeds of tropical cyclones of Cat 4-Cat 5 intensity, to be 30-50 mph lower than what they would be measured in the 1-minute sustained windspeed level. For example, both recent typhoons Megi and Bopha, universally recognized by the meteorological community and by posterity as Category 5-equivalent cyclones (a fact confirmed by satellite, and in the case of Megi aircraft recon data) were stated by PAGASA has packing winds of 130-140 mph on the 10-minute sustained windspeed scale. The reporting by the news media of Haiyan containing winds sustained at 195 mph, with gusts to 235 mph, was in no way an attempt by them to inflate the numbers. They were simply reporting the advisories issued by the JTWC using the scale most commonly used by reporting on tropical cyclones. The fact that, again, there is a discrepancy between the PAGASA advisories, and the JTWC advisories is simply because they use different ways of measuring the wind speeds. Admitting that you made a mistake does not reflect in any negative way your pass blog reports, or your cause, and will likely strengthen it. However, if you choose to continue this notion, that Haiyan was “only” a Catergory 4 hurricane, it will look like one of three things, either you are too stubborn to admit you are wrong, you do not know enough about hurricanes to know that you are wrong, or that you are deliberately trying to mislead people for whatever reason, and you have been doing so from the first post. I do not think you are a bad person, and I think you just made a mistake, so simply issue a correction, and this fight will not have to go any further (if you want to see some sourcing to my points, look at my previous post). dbstealey thank you for being brave enough to acknowledge a correction. I’ve been wrong on the internet before and I know it hurts. It takes a man to speak out for what he believes in. It takes a good man to accept when he mis-speaks. Mr. Laden sounds rather pathetic and disconnected from reality. All of the deaths, 1200 or 12,000, are tragic. The destruction in the surge area is devestating, matching anything on the Mississippi coast after Katrina. His fixation on this storm being part of some larger, sinister, CO2 driven trend is dramatic rhetoric but sadly short on supporting facts. Storm trends are flat, where they are not down, world wide. Laden’s assertions to the opposite are products of his desperately wishingit were otherwise. And why not point out that major news organizations confused mph and kph in order to hype the storm? The major media distortions of weather related events cheapens weather events, making them political. It is not a mistake to call out so-called major media on this stuff. It is time we held media reports to reasonable qa/qc standards. Laden has posted a link on Twitter where donations can be made. He claims to have donated $50. I wouldn’t expect him to return to WUWT to donate. He is also claiming that AW is ‘looking for revenge’ by posting this challenge. Before the typhoon even made landfall, the MSM was crowing about ‘biggest storm in earth’s history!’ or something. We all knew where that was going … and that’s exactly what they’ve done. Many of them are now claiming that this was a man-made typhoon. Somebody had to counter the hyperbole … and quickly. That’s what AW is doing. Many thanks. 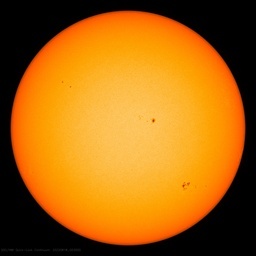 Is it my imagination or are AGW believers some of the dumbest clucks on the planet … or, at least, the most gullible? As far as Laden and his ilk are concerned , It reminds me of the words… Do not let the bastards grind us down! Interesting. This has happened here on WUWT. A fellow called “temp” claimed that all Socialists were racist – not just wrong which many here would have agreed with but RACIST!. It was pointed out that 25% of EU citizens vote that way; are a quarter of the EU racist? In the end I called him out as a false flag operation. Many on the right-wing strongly dislike us socialists but they don’t use those arguments. It’s all about liberty and individualism (fair enough), not politically correct dog-whistles. Sadly, I can’t find the thread right now. It seems that “temp” is a name that is hard to search for on a website where “temperature” occurs often. Anthony, you are a force for good. Another GBP 100 (PHP 7000) donated which I wouldn’t have thought of doing had it not been for your suggestion. WMO’s definition of sustained winds is 10 min at 33feet. That is the universal standard, a few years back National hurricane center used 8 min average, which has since been reduced to one minute average. Interestingly NOAA lists the definition of sustained winds as a two minute average. If they would stop monkeying around with the numbers and just use the WMO’s standards, there would not be this kind of confusion. The difference between 10min and 1 min average is usually 14%. The reason for the 10 min average is to reduce the influence of gusts. Sustained winds do the damage. 200mph 10min average winds would have done a lot more damage. The point is accurate reporting and the fact that NOAA can’t be trusted anymore to give accurate information without reading the fine print is kind of sad. Sensationalizing a storm for political purposes is kind of sick really. If your going to report on something, particularly sensitive topics, the facts are important the hype isn’t. Incidentally, “temp” also accuses my father of running away from a fight in order to taunt him into a flame war. Any regular reader of this blog knows my father (RichardSCourtney) is easily taunted into a fight. The accusation was ludicrous but did prey on the tolerant moderation policies here. Thank you to Man Bearpig. You have, I believe, correctly spotted a dirty tricks campaign against this blog. This storm was “the worst ever”. That was caused by an increase in global warming. There has been no increase in global warming now for 16 years and 11 months. So…what caused all this, exactly? Any argument that says such and such was the worst ever because of global warming will have this same problem, a lack of recent warming to feul it. Conclusion, sonething else must be feuling it, probably, hype. Donation to the Philippine Red Cross made; not as much as Robin at 2:32 pm made, but it’s all I can afford.I adamantly refuse to give to Oxfam as I have seen them in ‘action’ in Africa. They spend more on themselves than they do on helping other. dbstealey, M Courtney and Tim C. Don’t give to OXFAM. They are a UK organisation and very distant from the Philippines. They might be a charity, but a lot of their income is via the UK government. Nearly 50% in fact. Their income is over £380m/yr so they can easily spend huge amounts on the disaster. The Philippines charities are the ones that really need the money and they are the ones actually there now. They are the ones that can spend the money most efficiently, not OXFAM who will spend the money on sending their staff out to help. Sorry Anthony for distracting from the charity drive, but I want the money to go to those charities that will make the most difference to the people in the Philippines. David, first of all using the ten minute standard, the author of the blog contradicts his own post. In fact, I have gone through every single sub-900mb cyclone measured in the western Pacific since the 10-minute sustained wind speed measurement became commonly used for WPAC systems (roughly 1978). Of all the sub-900 mb storms, only one (Typhoon Tip) is recorded to have Catergory 5 equivalent winds (160 mph) using the 10-minute sustained wind metric. Therefore, by applying the 10-minute sustained wind metric, there has not been a single Category 5-equivalent cyclone in the WPAC since 1979. Not only is this assertion obviously false, it even contradicts Watts own post. In fact, based on the 10-minute wind speed measurement, Haiyan (147mph) is the second most powerful typhoon on record, second only to Typhoon Tip (160 mph), and right above Typhoon Bess (145 mph) as no other cyclone in the WPAC, at least from what I have seen, goes above the 140 mph 10 minute sustained wind speed measurement. Therefore, not only does the use of the 10-minute sustained windspeed measurement, still justify Haiyan being one of the most powerful, if not possibly the most powerful, tropical cyclone ever observed, this also shows that when comparing tropical cyclones, using the 10-minute sustained windspeed measurement simply does not work, as it would strip the Category 5 status of nearly every Catergory 5 hurricane ever recorded. In terms of your assertion that the National Hurricane Center in the past used a 8-minute average, at least from the records I have seen, they have not done so at least since 1969. For reference, the sustained wind speed records of Wilma, Mitch, Gilbert, Hugo, and Camille, are all listed using the 1-minute sustained wind speed measurement. What kind of idiots write this stuff? Grow up for god’s sake! Once again, USA steps up to the plate when a disaster devastates a poor country, yet these same countries revile us. There is and has never has been a country that is a greater force for good and compassion in the world than the United States. Very sad. Concience pricked, arm bent, 5000php sent. After so many debacles, Haiti being only the latest, I too have grave doubts about the Red Cross, Oxfam, plus anything UN-related. So I made my donation via Salvation Army Canada. Ps. My son and my friend in Cebu City both report that the typhoon passed north of them. They experienced very high winds, but afterwards saw only metal roofs strewn about. In Cebu City there were many private emergency generators (presumably to keep corporate computers running), so the inconvenience was really very slight there. Which further shows that industrialization and wealth do much not only to alleviate such tragedies as seen further north, but even to prevent them in the first place. Americans are generous to be sure, even to those who despise us, but it’s also true that we’re the only power on earth capable of helping out anywhere on the planet, thanks to our military. Please remember & thank veterans & serving personnel in our armed forces today. I just added 1000 PHP. Thanks for the heads up Anthony. Keep up the great work! Thanks for the link Anthony. Matched your donation. Tanks Anthony for this helpful initiative. Let the vinegar p*ssing Ladens enjoy their supremacy in solitude. I joined tour call and donated. In his next blog post, no doubt Mr. Laden will take credit for taunting WUWT’s proprietor and his “minions” into atoning somewhat for (indirectly) causing death and destruction in the Philippines with their “denialism”. There is and has never has been a country that is a greater force for good and compassion in the world than the United States. Very sad. Perhaps that’s why Americans feel less need to dig into their own pockets to help. @Pompous Git – that does not look like your note implied. It does look like that with the exception of Switzerland, the top countries are all former colonies of the UK. But even at #5 (tied), it still kinds of outshines the non-English Speaking countries of the world. Given we have the likes of Biden and Obama (basically giving 0), I am not ashamed at our numbers or ranking. Please remember & thank veterans & serving personnel in our armed forces today. I enjoy following your blog and check it nearly every day. In the interests of accuracy and correctness would you please clearly answer Dylan and others assertions on wind speeds and measurement methods. Mr Laden is probably just picking a fight to bump up the numbers at his blog. Do. Not. Bite. Many are the USN squids who hold fond memories of the Antipodes. Ditto the other services. Two blocks away in my tiny home town lived a lucky guy with an Australian war bride, whose son became holder of most of the athletic records at the high school named for my Scots immigrant great granddad. She is but one among many such. Sadly, you are correct that not just Hobart but all allied ports of call are less frequented these days. OK — I donated 1,000 PHP — but not before looking up the exchange rate — it’s not that I don’t trust you Anthony — but — well you know how it is. Had to fill out a lot of info, and I kept looking at the secure certificates. Wasn’t sure what to put down for a village or locale — it wouldn’t let me leave it blank, so I entered “None”, and it accepted that. Will be checking my online account to make sure that it didn’t charge me something different. 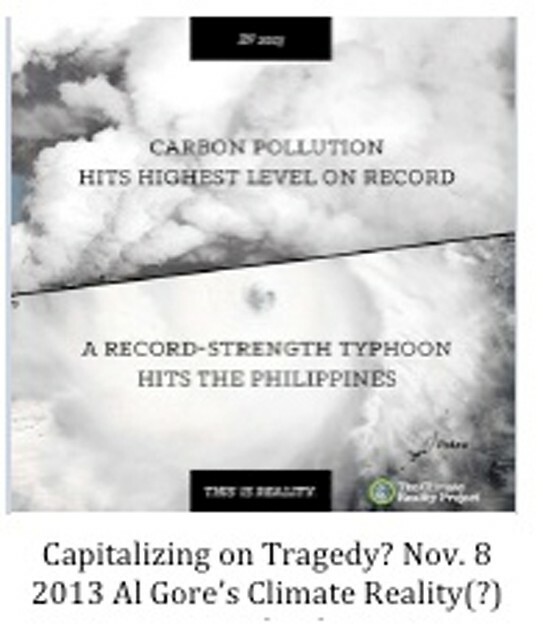 Dylan and CoIA ,typhoons happen and they are not caused by man made CO2. Say what!? You’re making this up as you go, aren’t you. Anthony’s charity is anonymous! He gave to the Red Cross, so the recipients will not know Anthony made the actual donation. That is what is meant by ‘anonymous gifts’; ones where the recipients do not know who is the donator. That’s a sentence right out of tyranny or communism and is meant to diminish or demonize people who donate their time, money or both. Everyone should be D__n proud if they’re kind, generous or just plain good people. Usually they’re not popping with pride as those sorts of folks tend to be humble. Did Anthony or any of the other questioners of bad climate science blogs write entire posts about their kindness or generosity? Absolutely not! The mention about the ‘donation’ is just a few lines and is a direct challenge to the antagonistic CAGW alarmist. The amount Anthony donated in his ‘first’ donation sets the bar for the challenged. It also helps others decide on an amount to donate. So take your high and mighty mockery and go find something useful to do, like take a trip to the Philippines to rebuild; be sure to do it anonymously. P. Red Cross paypal 1308 PhP = 30.84 USD. Not bragging but exhorting! You have the resource on the sidebar, your turn. Last I checked, it is considered bad form to desire, insist, insinuate or otherwise demand that ‘more’ people be considered dead, maimed or homeless. Hope is about desiring the eventual number hurt or killed by a disaster be as low as possible. Nice that the loon is announcing it to the world about how he believes in bigger nastier disasters to humanity and how he already knows the responsible scapegoats… Duh! What nerve of Greg Laden attempting to score political points over the tragedy in the Philippines. There is no question that the typhoon was HUGE with loss of life and considerable damage. Was it the largest? NO. Was it the most destructive? – NO. Was it the deadliest? – NO. Does it have anything to do with Climate Change – NO. Does it have anything to do with CAGW – HELL NO. Does it have anything to do with CO2? – BLOODY HELL NO! In a Darwin Museum there is a section devoted Cyclone Tracey a category 3 cyclone that literally wiped out Darwin back in 1974. In the display is a section of a tree trunk about 500 mm or 20 in in diameter and 2 m long from memory, the reason this tree trunk is there is the sheet of custom orb roof sheeting protruding right through it! An image that has stuck with me for years. There appears to be a question about the wind speed and on what basis it is calculated by the different authorities ( 1 min 10 min 8 min or what ever) that needs to be clarified and comparable speeds stated, I would believe a reasonable request and certainly something within the scope of someone on this site. Is it? Or are you guessing? It was noted within that article that the 235mph was likely a misunderstood 235kmh publication. Once misunderstood the gory hunting alarmists were thrilled to trumpet the error worldwide and are fighting a return to accuracy. Confusion? Yes, but not the way you’re trying to tell it. Confusion about misunderstood numbers means reading the number, e.g. ‘235’, and mentally adding ‘mph’ instead of the printed ‘kmh’. It is a lot harder to mentally confuse 235kmh with 195mph sustained winds. Bluntly stated, the msm has been running wild about Haiyan for days now. Claiming that Anthony is in error because he has posted the truth and then twisting 1 minute sustained measurements versus 10 minute measurements as somehow proving that Haiyan was as powerful as the msm hype to support your claim is just plain wrong. The WMO’s official measurement method for typhoons is a 10 minute sustained wind speed at 10m high and most news services tracking dangerous typhoons and posting warnings to residents use that metric. They should cite the source and state the metric used. Which brings us to, using the meteorology services that actually tracked the storm and recorded metrics, post the correct stats instead of hand waving and confusing Saffir-Simpson versus WMO 10 minute sustained wind scale. “on what basis it is calculated by the different authorities ( 1 min 10 min 8 min or what ever) ” or is it that there simply is no definitive standard hence neither you or Dylan will get an answer here or anywhere else ? Perhaps you can do the work yourself and find this authority then tell us, if anyone can ? I appreciate this was said from the heart but (as from here in the UK about 6,500 miles away) I don’t know anything at all about Phillipines’ charities (what does it take to be a “charity” there, what is the legal oversight, are they reliable, do they have the resources to stay the course, how badly have their own people and families been affected by the typhoon, etc) – whereas I do know this about UK charities, and how to create an almighty stink if any UK charity doesn’t do what it says it will do to provide help. Surely the most important thing is that we are all trying to help, in the way our own experience tells us is most effective as from our own part of the world? I once took one of those multi- axis online political tests and found myself next to the Dalai Lama in the direction of Mahatma Gandhi. The test identified me as a leftist and I assure you that is far from my what I am. Liberal in the classic sense, perhaps, but far from the modern progressive, liberals or socialists, or whatever the modern left uses to identify themselves, as I’ve come to know them. I don’t know how Gandhi or the Dalai Lama would score on the test, but I assure you, if modern leftists are trying to liken themselves to either figure, then the Leftists are lying. Typhoon Tip was also gigantic in area, dwarfing Haiyan. The test identified me as a leftist and I assure you that is far from my what I am. Liberal in the classic sense, perhaps, but far from the modern progressive, liberals or socialists, or whatever the modern left uses to identify themselves, as I’ve come to know them. The reason you don’t think of yourself as “a leftie” is that yo’re not. Neither am I and that was my point. There’s a huge difference between the “looney left” and being “left of centre”. And the “looney right” are just as bad as the “looney left”. Both want to take away our liberty. Better to refer to both as “Statists”, or perhaps “Nanny Statists”. It is “us” versus “them”, but it’s not “left-of-centre” versus “right-of-centre”. Anthony, I apologize for not being more clear @November 10, 2013 at 11:59 pm (1471739). Bloke Down the Pub@1471821 deciphered it. I was trying to say your earlier post (rightfully) criticizing the horrible reporting and record keeping was not worthy of Laden’s derision as if you were saying the storm wasn’t as damaging as it was. The inference that Laden has made was unjustified. We should all ALWAYS be able to criticize the reporting of the crime (or event, in this case) without being accused of condoning it. Thanks for being such a class act. To Sunspot, two things first I do cite Typhoon Tip in my post, you may go back and read it again, but for convenience here is where I mention it. In regards to typhoon Nancy, the reason I do not cite it, and the reason I do not cite any pre-1978 WPAC cyclones, is due to the fact that as far as my knowledge, records of their intensity are only recorded in the 1-minute sustained wind speed measurement, and therefore are not directly comparable to those storms measured in the 10-minute sustained wind speed measurement. Also, I let me be clear in that I am in no way asserting that climate change is the cause of Haiyan’s intensity, extreme events occur from time to time, and it is not outside the realm of realism to see a storm like Haiyan, even with it’s incredible power, occur. The 195 mph sustained winds, 235 mph gusts were the estimates in the advisories issued by the JTWC on Typhoon Haiyan, a legitimate and recognized meteorological agency and it is in no way irresponsible for journalists to use this number when reporting on the storm. Even using the 10-minute wind speed measure, at least according to what I have looked up, that would make Haiyan’s 10-minute wind speed measurement of sustained winds at 147 mph to be the second highest wind speed estimate ever recorded, the only storm recorded stronger than Haiyan since the 10-minute windspeed measurement for WPAC systems became used after 1978 is Typhoon Tip, with a ten minute wind speed measurement of 160 mph. This measurement is also, from at least what I have observed, the only Catergory-5 equivalent winds speed ever measured in a WPAC system using the 10-minute wind speed measurement. If you can find 10-minute windspeed measurements besides Typhoon Tip for WPAC systems that are higher than Haiyan’s, I would greatly appreciate it but so far among all sub-900 mb systems that have occurred in the WPAC after 1978, I have found none. Or that Watt’s original point is wrong, in that his confusion of the 10-minute sustained wind measurement with the 1-minute sustained wind measurement resulted in him confusing a Category 4 hurricane as one would understand it in the American context, with a Category 4 equivalent when using the standard WMO measuring system. Therefore, Haiyan was in fact at least a Category 5 equivalent cyclone, and quite possible one of the strongest ever observed, at the strongest to ever make landfall. It is important to note that Talcoban was not the initial landfall point, and therefore does not reflect the peak intensity of Haiyan at landfall. It should also be noted, as observed in intense cyclones such as Hurricane Andrew, damage areas are not always uniform for a number of reasons related to the structure of the storm, local architecture, local geography etc, and there will be varied areas of greater and lesser destruction. In terms of where to measure the intensity of the storm, Guiuan and Eastern Samar would be the best area to attempt to estimate the intensity of the storm at landfall, these are some aerial shots taken in the past day of the area. I’ve done the Political Compass thing many times and I always come out as a Libertarian Socialist. To be honest, that does fit with my viewpouint. Yet the nature of the Political Compass is to put the two axis (Libertarian-Authoritarian, Collective Ownership-Capitalist Ownership) on the same scale. In my mind the Libertarian-Authoritarian axis is far more important. The compass should be very tall, not square. Inspiring gathering! I made a 4000 PHP gift through RC and would like it to be tallied with whatever other WUWT gifts you are compiling. Am grateful to be part of it. I made my donation to ShelterBox – you might want to consider doing the same; credit card only. I’m afraid Oxfam are off of my charity giving list, as are all cheerleaders of CAGW. I’m happy to assist this appeal for donations to victims of the typhoon in the Philippines as well as the challenge to Greg Laden the serial liar and libel merchant. What a wanker that guy is! I’d been having great fun making comments at Greg’s blog, but he obviously couldn’t take it. – He wouldn’t let me post a link to a graph compiled by Dr Ryan Maue because he said it was ‘denialist’. I wonder what Dr Maue thinks of Greg’s derogatory labeling of his academic work. – Greg said I was ‘lying’ about having a 14 year old son. My son looked at Greg’s comment and just laughed. – Greg has now banned me. Ho hum, I’m heartbroken. BTW Greg demonstrated his ignorance when he admitted to another commenter that he didn’t know what 5000 php was. I donated 10,000 PHP to the Red Cross, for Typhoon Haiyan relief. Proof upon request. I am not rich; I am retired and living on a fixed income. Somewhat oddly, The Git has drifted from slightly right of centre to slightly left of centre over four decades, though this may be an artifact of the questions asked at different times. Most of my life I have been self-employed and have always been happier so. The word “socialist” implies belief in a system where all are employees and there are no self-employed people. I have worked for government and big business and found little to distinguish between large bureaucracies. Hence my difficulty in thinking of myself as a socialist. I don’t think it is odd for someone to drift on the left right axis. It may be the questions that re asked or it may be the freedom of the agent at the time of questioning. In a large bureaucracy it is easy to hide and go with the flow. But efficient bureaucracies allow each agent to achieve their goals in their own way while providing direction and resources. If they stifle the freedom while providing direction they stagnate an die having crushed the individual first. But they do not have to do that. As a higher direction than the individual is essential to socialism it is easy to feel that is restrictive when the society is crushing your abilities. But a shared sense of values is not crushing. Shared resources can be enabling.. TA problem is that the ability to correct failed bureaucracies is rarely with the individual. Hence the response to bureaucracies can vary with time and circumstance. Estimates by the JTWC are not definitive storm measurements. As you note so well with the term ‘estimates’. Where are the WMO official locality Haiyan track measurements and their associated links? Supplying the actual JTWC links would be nice too, especially as the NOAA rewritten versions are not trustworthy. Then you go on to compound your misleading strawman by restricting the list of typhoons to only those recorded during the 10 minute average wind speed measurement period. How long is that? Twenty years? Talk about cherry pick the data. Don’t forget that there are centuries of data regarding hurricanes and typhoons, though before the barometric pressure era you have to be satisfied with ‘gale force’ winds. e.g. Admiral Halsey lost three destroyers in 1944 to a typhoon where the estimated barometric pressure was 26.4 (off the scale of the barometer). Msm along with CAGW alarmists are preying upon unfortunate civilian events and their suffering. A very dishonorable and quite disgusting thing to do. Stop trying make Anthony out to be a bad guy for telling the truth! By the way, you’re not looking too honorable regarding this matter yourself. Charity should be anonymous say those who don’t donate! Should not donating be anonymous too? People who are saying this would be effusing admiration if obama made a public donation. Will be matching x2 via Kiva loans to the Philippines. My link shows that Australians give more out of their own pockets than US citizens. Your statement implied that every country in the world was inferior to the US. As an (adopted) Australian, I have no need to feel inferior. @Pompouos Git – Actually it was not my statement that you were replying to initially when you presented the chart. That was Chuck L. I was just remarking that while the US is not #1, it was still up there at the top. I failed to impart what was in my mind when I typed that. The frift is opposite in sign to what I expected to find; that is right to left rather than vice versa. As for bureaucracies, I’m mild Aspergers and as is usual for aspies, I found myself frequently bullied when working in “co-operative” bureaucracies. I fully understand the need for co-operation in order for civilisation to exist, but find the political machinations unfathomable to say the least. REPLY: So the real question here Jon, did YOU step up and donate? I think not. – Anthony??? Very presumptuous aren’t we? I did donate … You need to grow up too! On the subject of which I do not understand how anyone could have missed the need to give from our relative riches to those suffering in this horrendous circumstance. It isn’t a left wing/right wing issue. I agree, time to leave out the politics. We are all human. For those like me who dislike the Red Cross, 12 other options are listed HERE. Sour grapes from them is all I’ve heard. Ain’t that the truth. I rather judge by actions and not supposed political affiliations. They certainly have no place on a charity drive. ….Perhaps that’s why Americans feel less need to dig into their own pockets to help. That is not what I am finding. Looks like it depends on how you slice and dice the information. (So whats new) Also it is a matter of the amount of disposable wealth. Those who would donate generously without even giving it much thought ten to twenty years ago may no longer even have a job today and therefore can’t donate more than a couple of bucks if that. ….. In the display is a section of a tree trunk about 500 mm or 20 in in diameter and 2 m long from memory, the reason this tree trunk is there is the sheet of custom orb roof sheeting protruding right through it! An image that has stuck with me for years…. My EX lived through the Palm Sunday Tornado that went through the state of Indiana in the 1960s. Helping during the clean up he saw a piece of straw driven all the way through a telephone pole. Weird. Supplying the actual JTWC links would be nice too, especially as the NOAA rewritten versions are not trustworthy. MAX WAVE HEIGHT- 50 FEET. Those who would donate generously without even giving it much thought ten to twenty years ago may no longer even have a job today and therefore can’t donate more than a couple of bucks if that. The village south of where I live (population 326 in 2011) had a fundraiser for the victims (Geeveston: Population, 1,431 in 2011). We raised over $25,000. Doesn’t sound all that great until you realise that ever so many were workers in forestry an industry now defunct because of the greens and local businesses depend for their income on the local populace. Pompous Gits like living in a rural community; sure we’re parochial, but at least you get noticed when you need help! Incidental to the fundraiser were the farmers donating stockfeed and machinery to Dunalley farmers who’d lost theirs. Your link is not data, its a forecast of possible weather which is estimated at the highest potential wind speed based on DVORAK T numbers from a satellite and rounded up to the nearest 5 knots. In general actual data is from land stations (given as 2min average), Buoys (given as 8min average) and aircraft (given as estimate of 1min average based on flight level winds and mathematically calculated to 1min avg at 33ft). David, I am well aware of that. ATheoK was enquiring about JTWC links. I am sure that the official ranking of this typhoon will be debated ad nauseum by many, much more qualified than I. Until it is resolved we can only hope that the victims do not become too much of a political or religious football, we all learn something and our leaders take away the right lessons from the disaster. Paradoxical Commandment No. 2: If you do good, people will accuse you of selfish ulterior motives. Do good anyway. Well done Anthony and to the the WUWT readers who have shown true class. Laden is attention seeking fool, I am also pleased to hear that he is retired – hate to think somone like this could be in the education system in some way. @The Pompous Git – Gladly – and thank you for the link. It was still very educational. Anyway, in behalf of my countrymen (I’m half Filipina), thank you so much for your heart of giving and it’s definitely not going to be in vain 🙂 God bless you. No, to both of them. The first looks to be NOAA’s version of the JTWC news briefing estimate. Furthermore, there is no ‘average wind speed’ or ‘sustained 1 minute wind speed’ or ‘gusts’. Which given that JTWC is estimating using satellite images, is the proper way to report their estimate. The second is not an official warning or news briefing. That looks to have part of the NOAA/JTWC header and is retyped by someone not associated with either NOAA or JTWC. Also check out the latest Haiyan threads. Thanks for the link to the Philippines Red Cross, Anthony. I have matched your contribution. Best regards from Sweden, and keep up the good work! Is this a joke? The Red Cross is a useless organization. 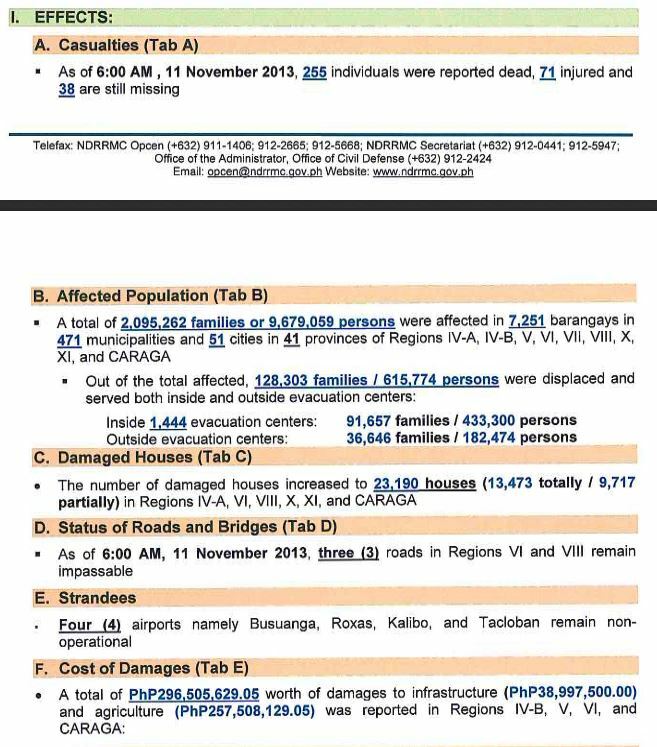 Not as covered are the number of missing (1,611), injured (23,404), affected (10,004,125), displaced (4,300,486). Still nothing from G. Laden?